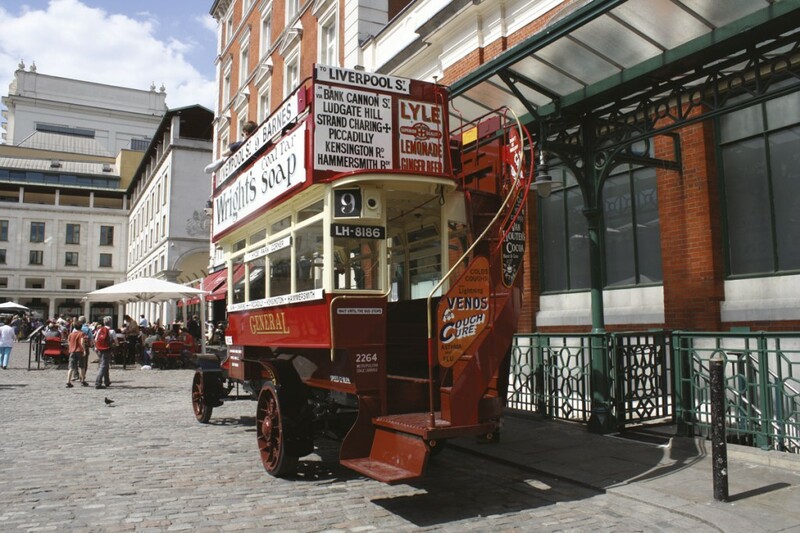 Members of the public, bus enthusiasts and press were gathered outside the London Transport Museum in a sun-drenched Covent Garden Plaza for the unveiling of a restored open top AEC B-type bus this week; one of only four in existence. 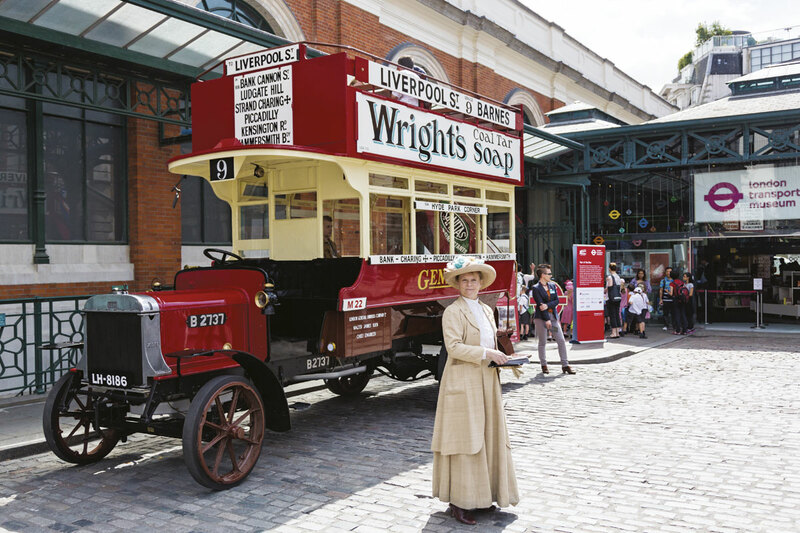 The project was funded thanks to a £750,000 grant from the Heritage Lottery Fund and forms part of the museum’s ‘Year of the Bus’ and First World War commemorations; ‘Goodbye Piccadilly – from the Home Front to the Western Front’. 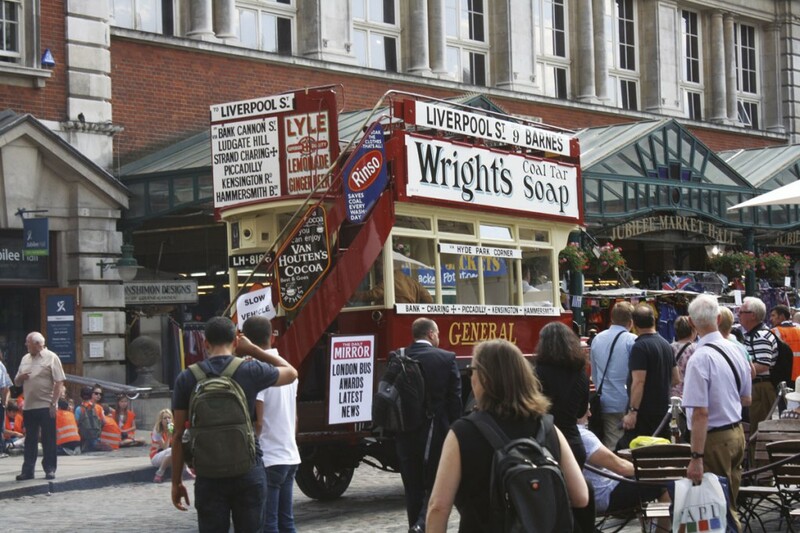 This was the double decker’s inaugural public appearance since the restoration by London Transport Museum curator, Tim Shields and independent restorer Richard Peskett, began just over a year ago. Much of the £250,000 spent to restore the bus was used to source original parts. The body had been sold off sometime during the 1920s by the London General Omnibus Company and had been used as a garden shed by its owners in Horley before being recovered in the late ‘80s when it was placed in storage with a view for future restoration. The length and breadth of Britain was scoured for original parts, including the chassis, gearboxes and engine, with some pieces even coming from as far afield as Australia, where 40 buses had been exported after being decommissioned from London. 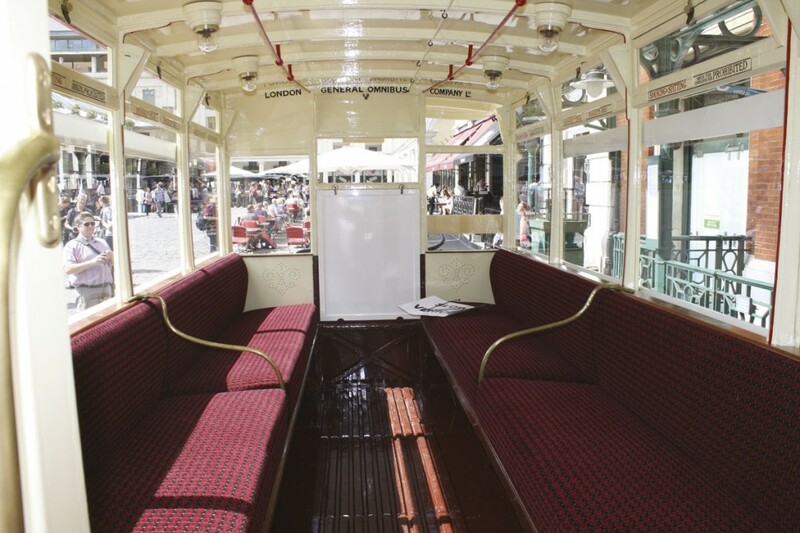 The lower deck saloon is fitted with electric lighting, which was first introduced on buses in 1912. Cushioned bench seats run along each side of the vehicle with a brass arm creating a divide. They are covered in authentic moquette, based on a fragment of fabric discovered during restoration and lovingly recreated by Holdsworth Fabrics, the same company who produced the original B-Type moquette. Punched panels at the front of the vehicle in a period design and red piping to the rich cream paintwork provide the only decorative feel to the rather stark interior. Overhead hand-painted signs, proclaiming ‘Smoking and spitting inside this omnibus is prohibited’ and ‘beware of pick pockets male and female’ give an insight as to what the journey may have been like. After negotiating the steep, narrow rear staircase, emblazoned with a number of bright, advertising panels, which included Venos Cough Cure and Camp coffee, you are then exposed to the elements of the top deck. 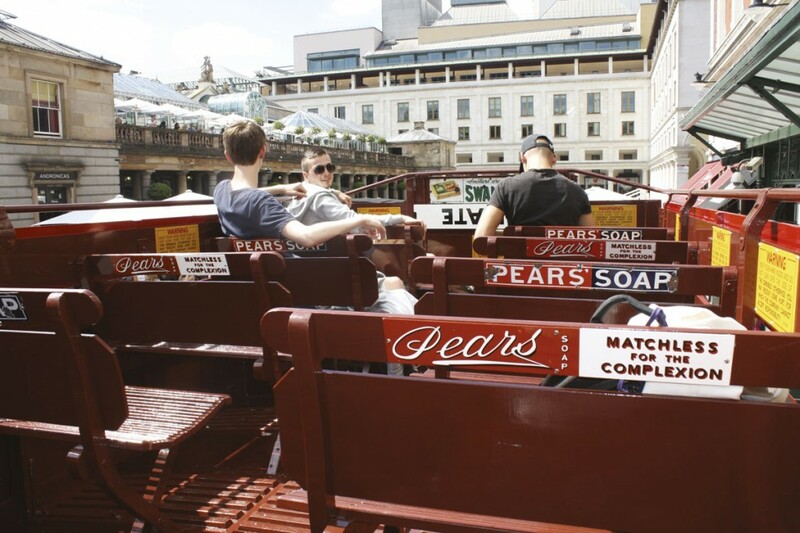 The wooden uncovered benches are a contrast to the cushioned seats of the saloon, but carry some original and reproduction advertisement signs, in the case of this vehicle for Pears soap. They will seat two, rather snugly, side-by-side. If the discreet signs of the lower deck caused alarm, then the large yellow warning signs placed just below the guard rail stating that by not keeping your arms inside the vehicle or leaning over the side you ‘may receive some hurt’, may cause more. The feint smell of new paint hung lightly over the vehicle, evidence that this was a close run restoration project. 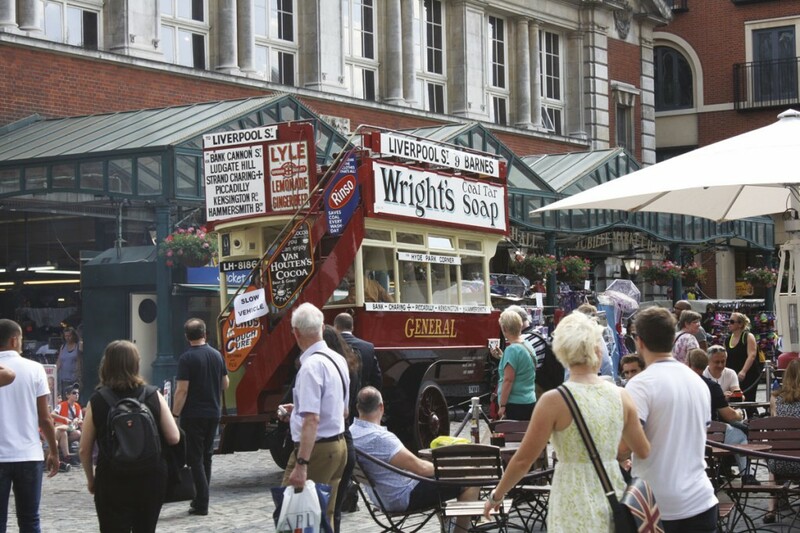 The bus was brought to Covent Garden on a trailer as work still remains to be completed in order to make it fully road worthy before its trip to France and Belgium in September, but it does run and it was a delight to see it manoeuvring its way through the busy plaza towards the end of the afternoon. In September of this year, B2737 will undergo another major facelift when it is converted into a ‘battle bus’- a WW1 military vehicle. During the beginning of the First World War, the War Department requisitioned the B-type along with its drivers and engineers for use in service. As well as transporting troops, others were converted to ambulances, gun carriages and some to pigeon lofts, allowing vital messages to be sent from the front line back to HQ. True to how it would have looked at the time, the bus will have the windows boarded and be painted green. Modifications will need to be made to make it road worthy and legal before it sets off on its journey to the battlefields of Ypres, Arras and Passchendaele as a mark of respect to those that gave their lives during the Great War and the transport workers who served and made sacrifices as part of the war effort.The vehicle will also join a parade of classic and historic vehicles in France, to mark the centenary of the war. Some of the remaining funding is being used to support this project, although allocations have also been made for apprenticeships, educational programmes and collections support. LTM have also launched a crowd funding campaign where members of the public can pledge support and earn rewards ranging from posters to a trip on the bus to Ypres. B2737, is one of only four remaining B-type buses and was built at the AEC Works in Walthamstow in 1914. It operated on route 9 between Barnes and Liverpool Street, with a single ordinary ticket costing 3½d. 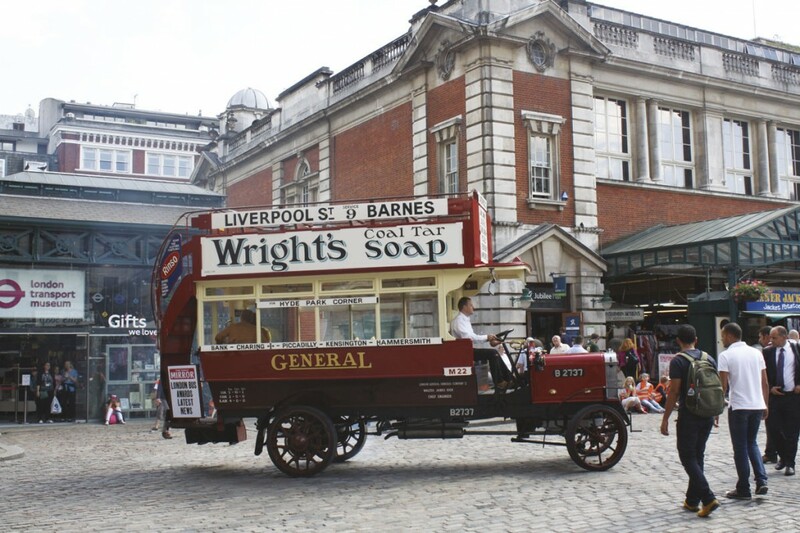 They are affectionately referred to as the Edwardian Routemaster and were first placed in to service in 1910 by the London General Omnibus Company. It was the world’s first reliable, mass produced motor bus with interchangeable parts which also met the 3.5ton weight limit, which was introduced in March of that year. With a top speed of 16mph, it seated 34 passengers. Despite being an innovative vehicle, it was far from comfortable, with solid rubber tyres making for a bumpy ride whilst the open top upper deck and exposed cab sides made for an unpleasant journey for both passengers and driver during cold, wet weather. Within four years, almost 2,500 B-types were in operation on London’s roads covering 112 routes stretching to Windsor, St Albans and Maidenhead.